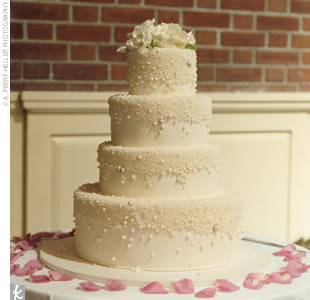 I browsed through all of The Knot's posted wedding cakes that are white and I picked out a few that were my favorite. I think my top choice of all the cakes I've seen is still the one I posted on a few weeks ago, but it never hurts to look around and be sure! I'm loving the foilage on this one! "An understated, but elegant confection of buttermilk spice cake and cream cheese filling tempted guests. 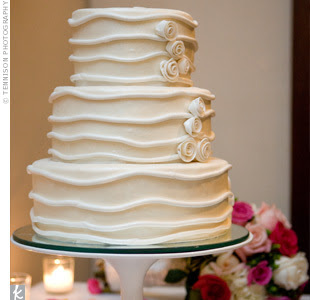 White foliage draped across all four tiers, matching perfectly with the light buttercream icing." Cute. I like the lines... but not sure if I'd want this for my wedding. "A white swirl floral motif accented each of the fondant-covered tiers, which were chocolate with raspberry filling, French vanilla with strawberry filling, and mango with mango puree." Mmm... that sounds delicious! I think I'm attracted to anything with leaves/floral scroll work. " 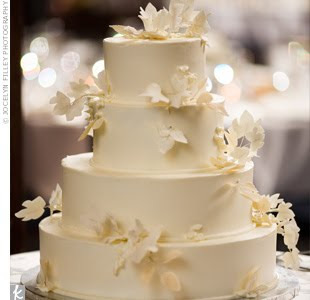 A square-shaped middle tier and sweet, delicate accents combine to create a chic, sophisticated wedding cake. " The pearl look is neat. 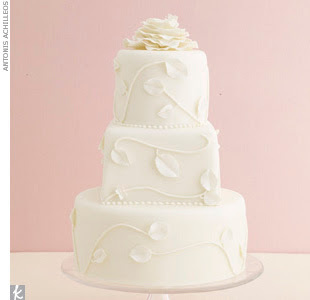 "The four-tiered ivory cake was covered with fondant and decorated with different-sized, white and ivory, sugar pearls. To top it off, white peonies and roses were placed on the top tier." Okay, the idea behind this one is just so sweet. I love when people tie something that meaningful into their weddings. "Because Sunny didn't wear "something borrowed or blue" from her mother, she decided to have the wedding cake designed after the lace from her mom's wedding dress. 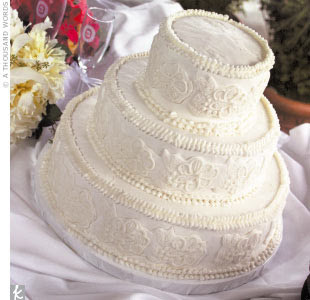 The cake designer hand-piped the design of the lace into the white buttercream icing. "It turned out beautifully, and my parents were honored to have this as a tribute to their wedding day," remembers Sunny." So... the cake search continues! you have to manually code with HTML. I'm starting a blog soon but have no coding skills so I wanted to get advice from someone with experience. Any help would be enormously appreciated! blog and I am impressed! Very helpful info specially the last part :) I care for such info a lot. mind prior to writing. I've had difficulty clearing my mind in getting my thoughts out there. I do take pleasure in writing however it just seems like the first 10 to 15 minutes tend to be wasted just trying to figure out how to begin. Any suggestions or tips? Thank you! Thanks for one's marvelous posting! I seriously enjoyed reading it, you will be a great author.I will make sure to bookmark your blog and may come back someday. I want to encourage you to definitely continue your great work, have a nice evening! There's definately a lot to find out about this topic. I like all the points you've made. What's up, of course this post is genuinely pleasant and I have learned lot of things from it concerning blogging. thanks. Hello everyone, it's my first pay a visit at this website, and article is really fruitful in support of me, keep up posting these articles. time to be happy. I've learn this put up and if I may I desire to suggest you few attention-grabbing things or tips. Perhaps you can write next articles regarding this article. I want to learn even more things about it! be happy. I've read this post and if I could I want to suggest you some interesting things or suggestions. Perhaps you can write next articles referring to this article. I want to read even more things about it! you've done a fantastic job on this subject! It is appropriate time to make some plans for the future and it's time to be happy. I have read this submit and if I may I wish to counsel you few interesting things or suggestions. Perhaps you can write subsequent articles referring to this article. I desire to read more things approximately it!